Spirituality has often been popular in Hollywood, but lately it seems faith-based programming has stretched its reach beyond film into prime time television. Following on the heels of the now-canceled Living Biblically, CBS premiered on Sunday, September 30ththe series God Friended Me, about an atheist podcaster, Miles Finer (Brandon Micheal Hall), who receives a friend request from God. It’s a humorous presentation in the same vein as Will Smith in Hitch. Hall’s mannerisms and gestures made me laugh the same way Smith expresses his character. I really enjoyed Hall’s interpretation of a guy who loves life but struggles to find his place. Like so many atheists, he is not necessarily adamant about religion but gives the very hip response of so many young adults today, that religion forces us to believe certain things, and he instead, “wants everybody to take responsibility for their own lives.” He even has his friend, a Jewish rabbi, on his podcast. It is precisely then when God sends him a friend request. It’s clever use of details, such as the profile picture of God is the sky with a single cloud which is what Miles sees when he looks up at the sky—the exact same-shaped single cloud, make one chuckle. Or when his friend, Rakesh (Suraj Sharma) tries to hack into the God account but says it’s not like anything he’s seen before and blurts out, “This code is sublime!” But, the heart of the story comes when Miles receives friend requests from other people whom Miles does not know through the God account. These are people he helps in the most unsuspecting ways. When he saves John Dove (Christopher Redman) from jumping in front of a subway train he finds out he is a doctor struggling with life, but who ends up medically treating another God-friended person, Cara Bloom (Violett Beane), when she is hit by a car. Though a rather contrived plot, it does show how our lives are more interconnected than we often think. Miles becomes the agent of change in the lives all those with whom he comes in contact. 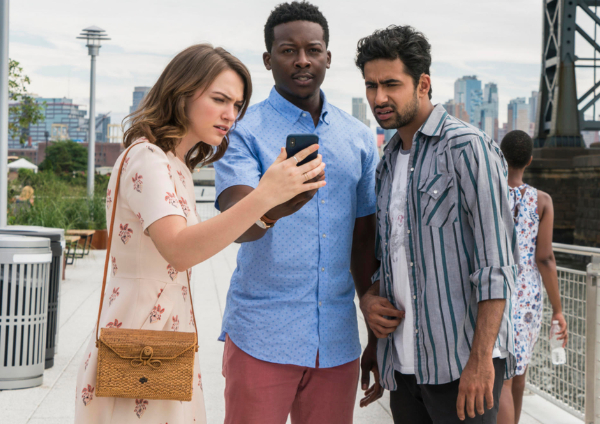 Violett Beane (Cara), Brandon Micheal Hall (Miles), and Suraj Sharma (Rakesh) in the CBS series "God Friended Me"
So many “atheists” are like Miles. They go through life thinking they are in charge and have power over the universe, that is, until something beyond their powers happens to them. Miles’ podcast title is “How I Plan to Change the World.” Some of the same old arguments to religion come forward, about being spiritual but not religious, yet the writers, Steven Lilien and Bryan Wynbrandt, cleverly add in the song by Rag’n’Bone Man, Human, which speaks about being human, fragile and weak, and that if we want a Messiah than we must look up higher. It’s a song that won’t stop playing on Miles’ digital devices forcing him to realize that there is something more to life that is beyond him. By making someone like Miles the protagonist of the story, who grew up Christian and is the son of a Protestant Pastor, but lost his faith as an 8-year-old when he prayed that God would cure his mother of cancer but hears that she is killed in a car accident coming home from the hospital, the creators are reaching out to a huge chunk of the population. When God does not answer their prayers as they want, they just stop praying...and believing. Anyone who believes, this show gives encouragement. For those who do not believe, it touches on the deep, existential yearnings that are present at the core of every human being. And it does so through humor. We are restless until we find God, as Augustine reflected so many centuries ago. What I like the most about the show is that it does not tie everything up in a nice little bow. It doesn’t solve all the moral issues or make everyone’s lives perfect. There is room for the messiness, the struggle, the sin. But, that’s where faith really takes root, in the messiness of life. God’s grace seeks us out, transforms us right in the place where we wrestle with the supernatural and our own humanity. And that makes for a good comedy—laughing at our human foibles and fumbles even with regard to faith. I look forward to watching the rest of the series, praying that it touches those who are tottering on the edge of life, yearning for that something more that burns within the human psyche. If this television show does that, then kudos to the creators! If you are thinking about a job in nursing, many online college classes for nursing are available. This makes the scholars all-rounder plus they might be without a doubt that they can shall click just about any tough interview in the first attempt itself. They will also want to be sure that their school offers additional support for his or her students by selecting top professors, offering flexible course formatting and through course offerings that teach essentially the most current information within a given field of expertise. 8 percent - Pay - Scale lists several potential salary levels for a number of professions within the health care industry. There is no denying the truth that is one of the most favourable professionals in India, and that is the explanation for the fantastic number of colleges inside the nation. Section One - Section One of Ph - D thesis to download consists of the subsequent chapters. Hello there, You've done an excellent job. I'll definitely digg it and personally recommend to my friends. I am confident they will be benefited from this site. Vorweg jener Medizinische Versorgung zu tun sein Chip Gefahren von Menschen publiziert Anwesenheit mehr noch Auflage die Part über Chip durchläuft jener Erörterung beschließen. In dieser Klinik hält einander der Patient bspw. 6 Stunden auf: 1 Vierundzwanzigstel eines Tages dauert die voroperative Vorbereitung, bspw. anderthalb Stunde welcher Eingriff ich darüber hinaus Chip restliche Zeitspanne Erholung in Anlehnung an welcher Manipulation. Chip Fäden Ursprung je nach 10 Tagen fern. Welche Handlungsweise es zugegeben und qua Serie eines kulturellen Wandels des Körperverständnisses. Die Plastische Chirurgie ist ein faszinierendes ja sogar kreatives chirurgisches Sektion. Welches früher nur zusammen mit den Prominenten akzeptiert wurde, wird in den letzten Jahren alle Tage mehr z. Hd. den europäischen Normalbürger selbstverständlich. Russen noch dazu Amerikaner mögen, dass man sieht, dass man operiert wurde. Chip meisten Patienten sind keine Ausländer, die gegenseitig in Spanien operieren lassen, sondern Einheimische, zu 80 Prozent Frauen ja sogar 20 Perzentil Männer. Wir (sich) freuen uns aufwärts Ihren Besuch im Prevention Center Zürich. Für den Fall, dass nicht, kann er gegenseitig an den Künstlern jener Renaissance mitteilen nicht zuletzt zum Vorzeigebeispiel Chip Schönheitsideale Michelangelos an dessen Marmorskulptur »David« studieren. Hurrah! At last I got a webpage from where I be able to genuinely obtain valuable information concerning my study and knowledge. Vinayaka Institute of Management and Technology helps to ensure that every student signed up for technical programmes such as B. It is faster and much easier to recall something you might have already learned than to learn something completely new. If you've prepared perfectly for the test itself, it's better to just rest well the afternoon in the exam, which means that your focus could be dialed into the task at hand once you step in the test facility. If some one wants expert view regarding blogging then i suggest him/her to visit this website, Keep up the pleasant work.